My little guy is in love with trains and has learned about Thomas. I have other costume ideas for his Halloween get-up but I think I just might make him one of these for fun around the house or maybe his next birthday party. How to make it: Cut the flaps off the bottom of the box. Cut halfway through the flap on the top of box, and use the remaining part of the flap to create the back of the train, using the photo as a guide. Toilet paper tubes can be used to make the whistles, and an oatmeal container stuffed with newspaper can make the blue dome. Use paper plates and/or oak tag (a hard card stock that's easier to cut than cardboard) for wheels and face. Paint, and attach ribbon or suspenders (clip them to the front and back) so that the costume will sit on your child's shoulders. Place weights behind face to keep the costume from riding up (Donna used a bag of change). 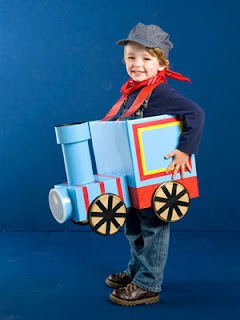 Dress your child in overalls underneath, and add a engineer cap if you own one -- perfect for your little Thomas fanatic. * Back-to-back red duct tape makes sturdy straps. 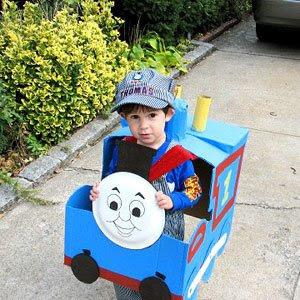 * Use painted boxes trimmed with colored electrical and duct tape for the main part of the train. * Recycle oatmeal canisters for the smokestack and headlight. * Create wheels out of round lids from coffee containers and black electrical tape.